A Directory of free crafts. Over 600 links to patterns or projects. Crochet this cute little fellow, I am sure he will make a great gift. On this site you can find a pattern to make lots of flower buttons. Use them in your projects to make them more beautiful and original. If you need storage and organization ideas, you can make this holder for your things to hang. Crochet this beautiful flower, you can use it as a dishcloth, coaster, applique and other various projects. Crochet this fish applique that you can use for your projects or maybe use it as a keychain. 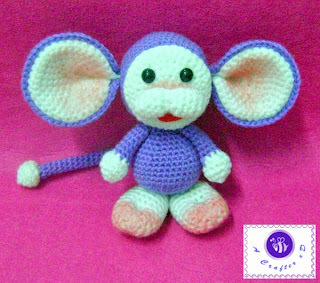 Crochet these two cute monkeys for your children, I am sure that they will have hours of fun. Crochet this cute puppy for your child or for a gift, I think it would make a great gift.